First off I am going to start by saying there are many options when it comes to the type of cloth diaper you want to use. I am only going to discuss the ones that I have used and know about. A good tip is to do like I did and buy a couple of each and see how you like each Style/ Brand before you buy a whole bunch. 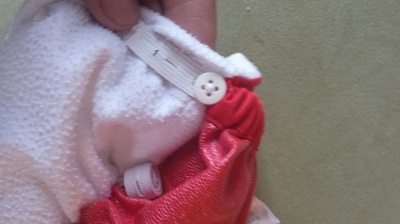 “All in Ones” are basically a diaper that has an “insert” (thick pad) already sewn into them. 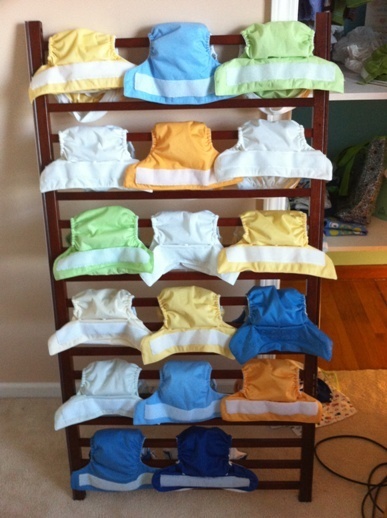 They are good for people who don’t want to take the time to stuff their diapers as these are ready to go. However, I didn’t care for them simply because they take a lot longer then other CDs to air dry. (You shouldn’t put your diapers in the dryer since it will ruin the inside pul (water proof lining) and cause leaks. Also they are a lot more expensive then other kinds of CDs. One of my favorite brand’s of covers are “Flip Covers”. These kind of diapers are just the outside water proof cover with no soft lining or pocket for inserts to be stuffed into. 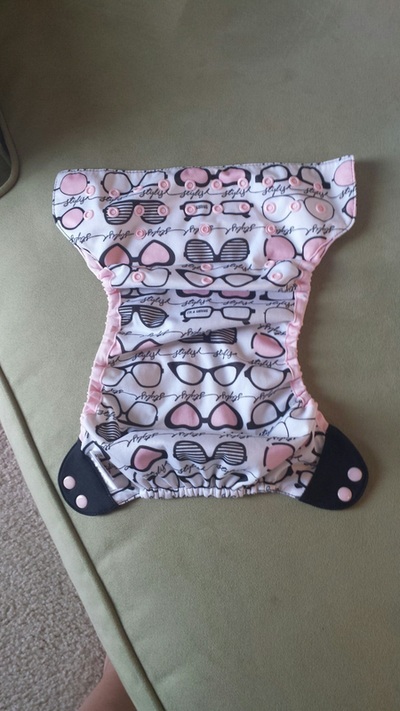 Instead you just lay your inserts on the inside then snap the diaper on your little one. When it is time to change their diaper open the diaper and just take the insert out and replace it with a clean one. You can continue to use the same cover all day ( unless it gets some nasty on it) this is good for those who don’t want to stuff diapers after each wash. These are less expensive then AIOs but not quite as reasonable as pocket diapers. This is what I have the most of. They are great if you are just starting out and want to get the hang of things before you go and invest in more expensive CDs. 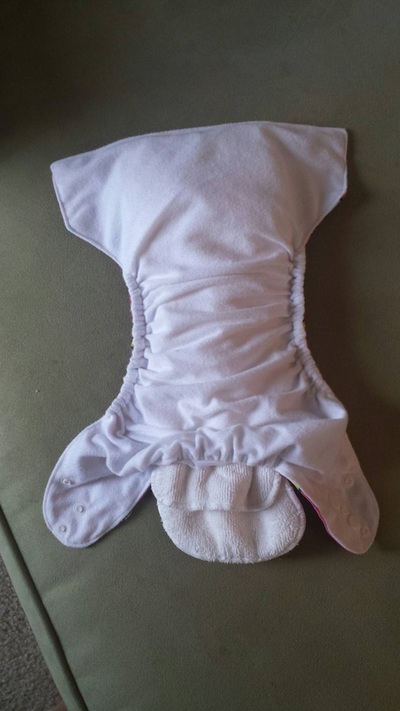 They are different from covers, in that they have a soft white lining on the inside with an opening on the back where you then take an insert and stuff it all the way through so it lays flat on the bottom of the diaper. 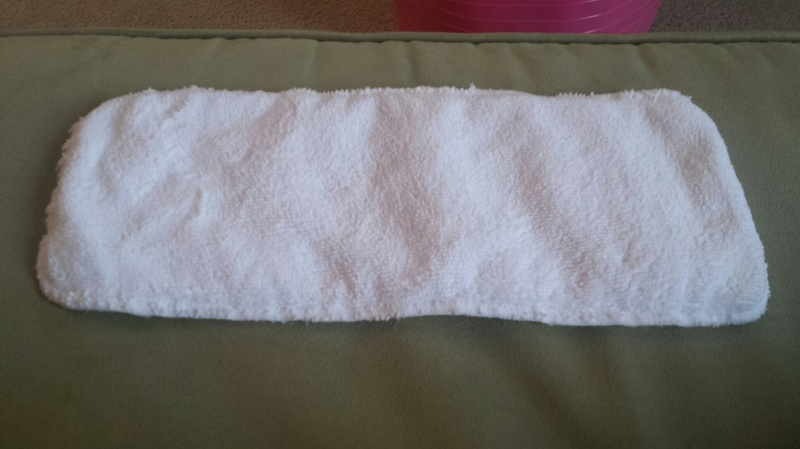 When you wash your diapers you pull the insert out the back. 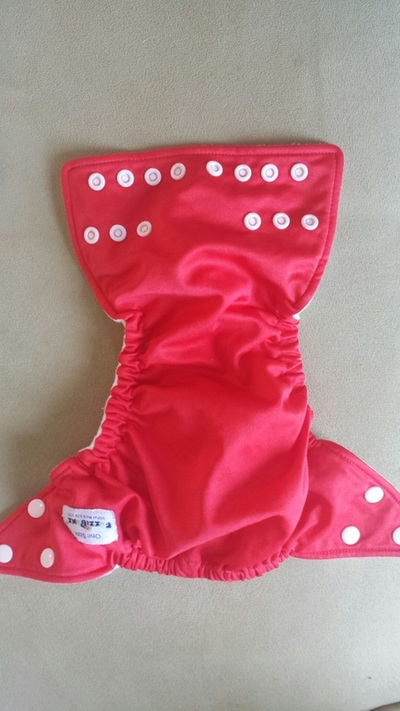 ( I always take my insert out right when I take the diaper off and put them into the wetbag separate) They are quick to dry and easy to put together. They are also very reasonably priced! Some favorite brands are Alva, Sunbaby and Charlie Banana. There are a few different kinds of inserts. 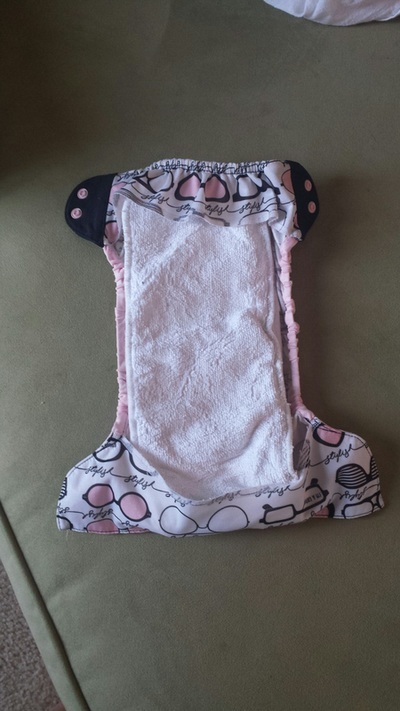 Microfiber inserts- They are what usually come with Pocket diapers. They are just a thick white microfiber piece. They work great but are not as absorbent as others. Flour Sack Towels- My favorite! 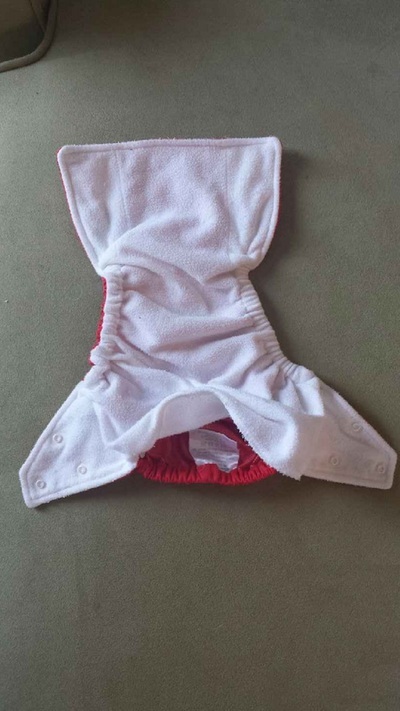 You get them at Walmart in the kitchen section for $4.88 a pack.They are like a small towel that you fold into in insert shape and then stuff or lay into the diaper. They are much more absorbent then microfiber. If you have a heavy wetter at night like I do, these things are amazing! 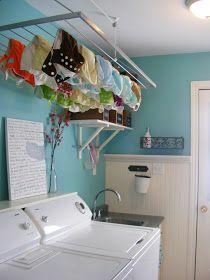 Tip- as with all new diapers or inserts PREWASH them at least 2 times. Then they will be able to absorb well. 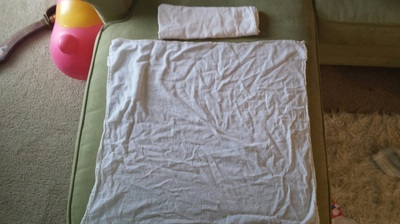 Flour Sack Towel. Open one on bottom folded one on top. 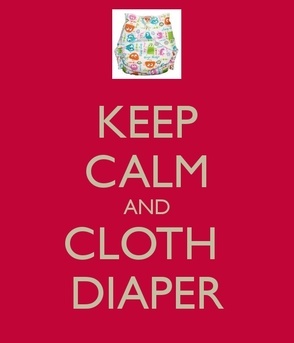 A Wetbag is used to store your used diapers until you are ready to wash them. 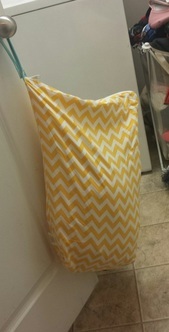 It is a heavy lined bag (like swimming pool lining) that keeps your diapers from leaking out or smelling. Once you are ready to wash your just pour the bag out into your washer and then drop the bag in too! I do not wash the bag every time. 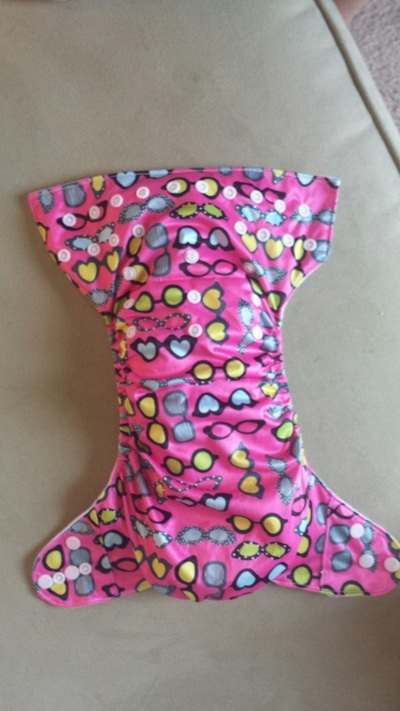 Also these bags come in many sizes so I keep one in my diaper bag for when I am out and Bristol needs a change. When I first started CDing I used a bucket system that worked pretty well but, I ended up changing to a Wetbag instead. If your little one in exclusively breastfed you don’t have to rinse off any diaper simply because there is zero consistency and it washes right out. In the first 2 months or so of CDing I had a large bucket/rubber basket that was half full of water mixed with borax that I would put the diapers in until they needed to be washed. A couple reasons why I DO NOT recommend this is because first off it is REALLY heavy to pour into the washer! It is a hazard to other little ones that might be able to get into it. Also it releases bacteria into the air, AND once your little one starts eating real food it smells awful! What is the point of using CD if you end up dealing with nastiness? Just a bad idea all around. I ended up trying out a wetbag that I had been hanging onto and loved it. Now I just put my CDs into the bag and dump the bag into the washer when it is full. *Note, before you put your CDs into your wetbag you may need to rinse them. There are may options such as diaper hoses or just rinsing them into the toilet. I haven’t had to use either. When we have a poopy we just plop that nasty blob into the toilet and toss the diaper into the wetbag. A lot of people have different opinions about what to and what not to use as a dertergent when washing but one thing is universal, DO NOT USE ANY SOFTENER. It will ruin your diapers. Another thing is, try to use ligther detergents like Dreft or something more natural. Although I know that some use Gain and such on their diapers and they work just fine. I use Melaleuca. It is what I have always used on all my clothes since I have very sensitive skin. It is a plant basic detergent but works wonderful. 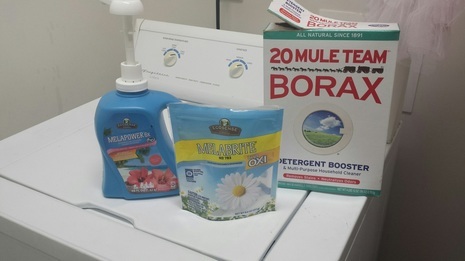 After I pour my diapers into the wash, I do a rinse cycle with some Borax. Then once that is done I turn my washer onto wash cycle and add 2 pumps of detergent and one brightener. ( Which is slightly more than I would use for 1 large load of laundry.) Please remember how much detergent you use can depend on the size load, as well as what kind of detergent you use. Never put your diapers into the dryer. As I mentioned before it can ruin the lining inside of your diapers. 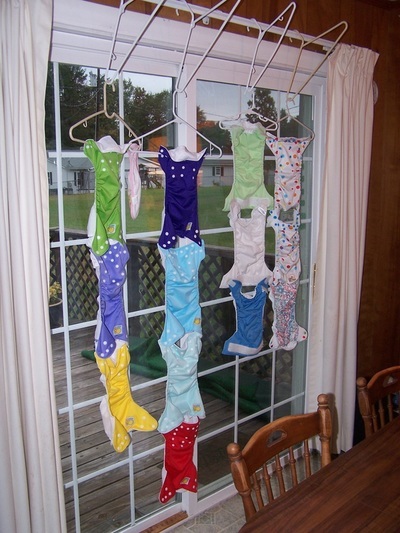 I have a drying rack ( as shown ) that I lay my dipars on to dry. Works great and was only $10 at Aldis. While my little one was exclusively breastfed after washing her diapers they still had a light brown stain on them. Mainly on the inserts. I thought I was doing something wrong and resorted to bleaching them. Which is a bad idea. It can cause your little one to have an awful rash. ( if for whatever reason you feel like you need to do a bleach wash, be sure to do an extra rinse.) However, I found this wonderful group of ladies who helped me adjust my cleaning routine to just what works for me. The absolute BEST way to get rid of tough stains on inserts/diapers is Sunning. 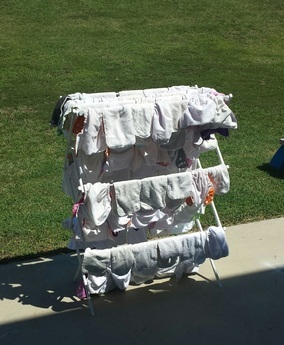 Put your rack out in the sun for a good 4-5 hours and it will fade those stains right out. Now everytime I wash, when the weather allows, I sun my diapers after. Trust me it sounds like it won’t work but it really does. After your diapers are dry it only takes a few mintutes to put your diapers together. If you have AIOs even less time. 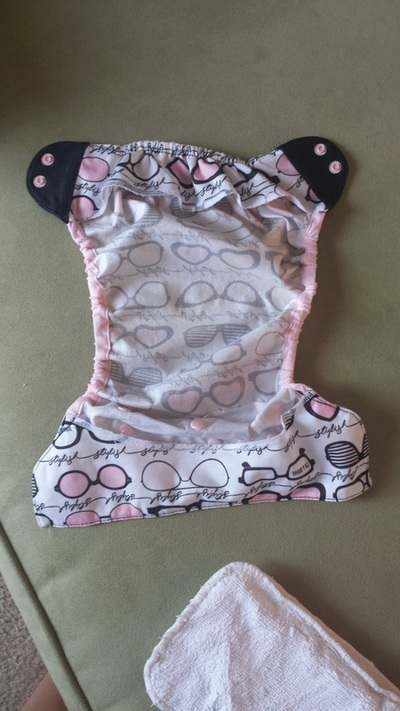 Fill the diaper with one or two inserts depending on the child and how much they wet. At first we only had to use 1 insert with Bristol but now that she is older we use 2 inserts or 1 Flour Sack Towel and 1 insert together during the day and at night we use 2 Flour Sack Towels. And that is how I Cloth Diaper! Please feel free to comment if you have any questions at all!